Stems: Flowering stalks erect, arising from spherical bulbs about 3/4 inch thick. Leaves: Basal, 2-6, grass-like, 4 to 10 inches long, less than 1/5 inch wide, flat; tips blunt or somewhat pointed. Inflorescences: Umbels, 3-11-flowered, terminal; subtended by 2 spathe bracts; bracts lanceolate, papery, many-nerved, downward pointing, eventually withering. Flowers: On thread-like stalks of unequal length; perianth segments 6, thin, about 1/3 inch long, white to greenish white, yellow toward base inside, distinct lavender to reddish purple nerve on back; tips pointed; stamens 6. Fruits: Capsules, about 1/5 inch long, with 3 compartments; seeds football-shaped, angular, black, 3 or more per compartment. Habitat: Prairies, open woods, disturbed sites, ditches, and rocky exposed ledges, most abundant on sandy soils. 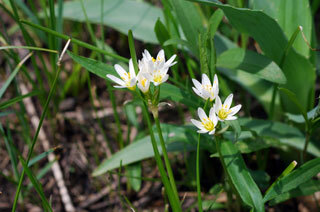 Comments: False garlic resembles wild onion but lacks the onion-like odor. Sometimes the plant will bloom again in the autumn.